The iPhone 5S has a design very similar to the 5 with a few hardware differences which make it only slightly more difficult to disassemble. The main feature of this model that contributes to the increased repair difficulty is the fingerprint scanner. It isn’t really all that much of an obstacle but care must be taken not to damage it when opening the phone. 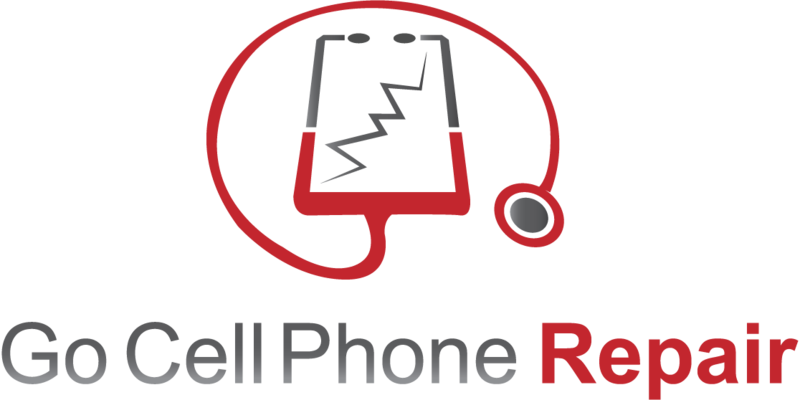 In the video below you will see the entire screen replacement from start to finish. Be sure to watch the whole tutorial as skipping ahead may cause you to omit very important steps. While some people might be able to lift the screen assembly out with a suction cup I have found that with the iPhone 5, 5S, and 5C it is much easier to use a thin metal pry tool like the iSesamo shown in the banner below the video. If you don’t have one on hand or the time to order one you might be able to get by with a one sided razor blade. Just be careful as it is easy to cut yourself if you are not careful. The blade should be inserted between the metal housing and plastic perimeter frame of the lens as shown in the video. Stay away from the home button area as one wrong slip can cause damage to the charging port and fingerprint scanner. Also remember that because of this cable you only want to open the phone up about half an inch at the bottom. From there you can release the metal retaining clip and the home buttons pop connector. The fingerprint scanner is attached to a flexible cable just beneath the home button. You will want to be very careful when opening the 5S because not only can this cable be damaged easily but there is a metal clip holding the cable in place. When removing this clip there is a good chance that it will literally fly out of the phone as if it were spring loaded. Make sure to shield the area around the bottom end of the phone so that if this does happen it won’t fly too far. This is also a good reason to make sure that you work in a very clean environment without any multi colored surfaces including but not limited to the carpeting on your floor. Finding this clip may be like looking for a needle in a haystack depending on where it lands. The clip after being removed from the phone. In the image below you can see the clip from the opposite side. The two slots at the top go in first and lock into place with the metal tabs above the flex cables terminal. The single tab at the bottom goes in last and prevents the clip from coming out until you pry behind it. 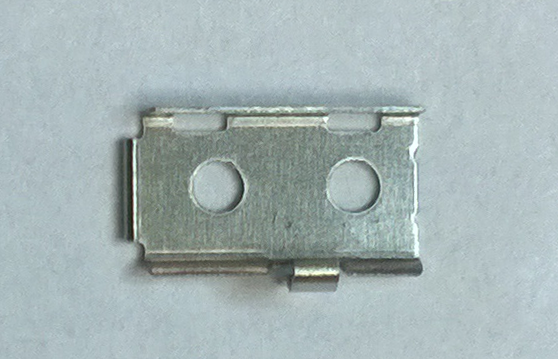 Bottom view of the retaining clip. It is worth noting that if you damage your fingerprint scanner you will not be able to repair it. While the home button can be replaced the scanner itself appears to be matched to the phone at the time of production. Replacing it with another one will disable your fingerprint scanning ability. This seems to be a problem unique to the iPhone 5S. In the next video we will replace a non-functional lightning port. 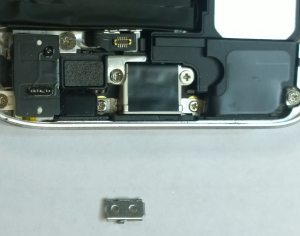 This is a fairly involved process and requires removal of the main speaker assembly at the bottom end of the phone. You will of course need to open up the front by removing the two pentalobe screws and prying the display assembly open. It does not necessarily need to be completely detached but you may find it easier to work on that way. 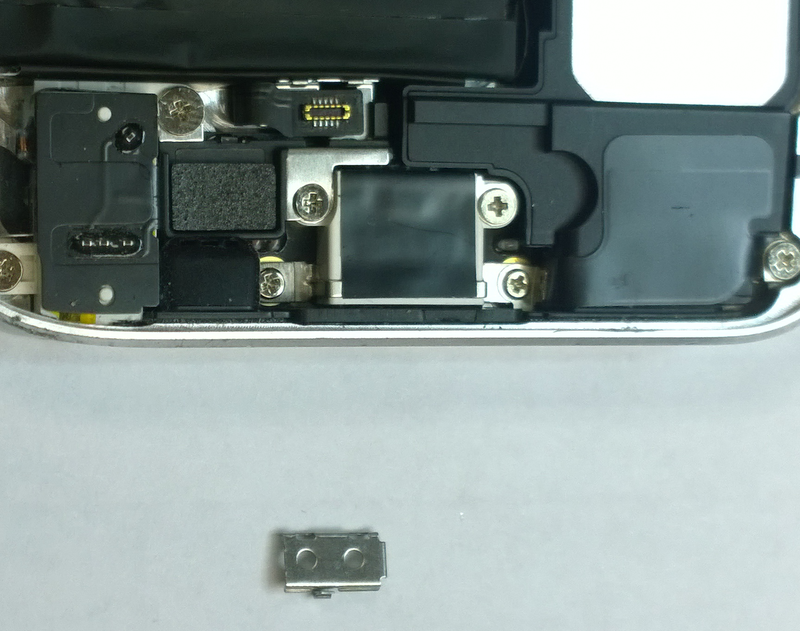 Be careful when opening as the fingerprint reader is plugged in between the display assembly and the lightning port area so opening the front too far before you unplug it can damage the cable. The replacement part can be purchased through the link below.